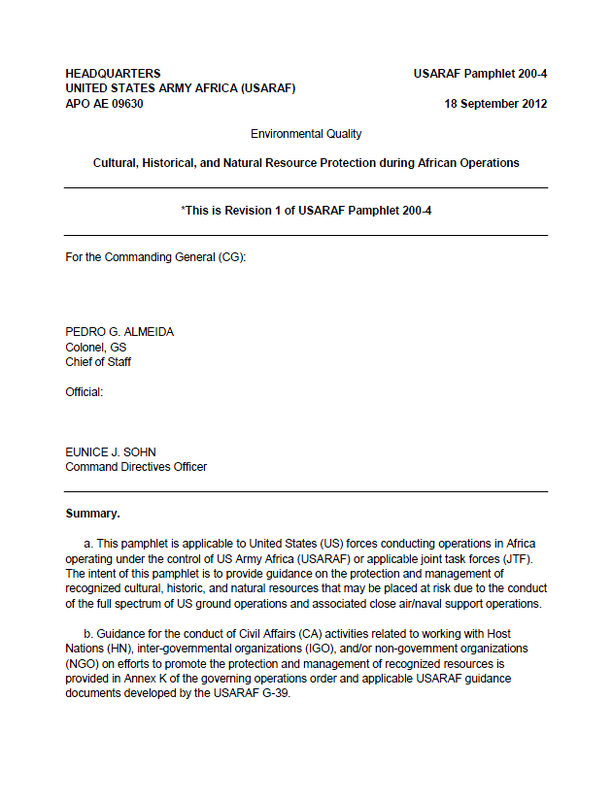 The following document detailing guidance for protecting cultural, historical and natural resources in African operations is part of a series published by U.S. Army Africa. The documents are not made publicly available, though this particular example was found posted to the document-sharing website Scribd. a. This pamphlet is applicable to United States (US) forces conducting operations in Africa operating under the control of US Army Africa (USARAF) or applicable joint task forces (JTF). The intent of this pamphlet is to provide guidance on the protection and management of recognized cultural, historic, and natural resources that may be placed at risk due to the conduct of the full spectrum of US ground operations and associated close air/naval support operations. b. Guidance for the conduct of Civil Affairs (CA) activities related to working with Host Nations (HN), inter-governmental organizations (IGO), and/or non-government organizations (NGO) on efforts to promote the protection and management of recognized resources is provided in Annex K of the governing operations order and applicable USARAF guidance documents developed by the USARAF G-39. a. Protection of the cultural and natural heritage of African peoples is an inherent task for every operation US forces may conduct in Africa. When conducting operations, US personnel will take every reasonable precaution, consistent with the demands of mission requirements and the rules of engagement to minimize damage to the physical artifacts and natural heritage that comprise the cultural patrimony of African peoples. b. Though the physical artifacts of the cultural and natural heritage of Africa may be irreplaceable, no artifact is worth a human life. At no time will the protection of these artifacts take precedence over the inherent and essential right of collective or individual self-defense, or the requirement to keep people from avoidable risk. c. US forces will conduct activities to protect and manage cultural and natural resources in compliance with applicable and appropriate US requirements, respecting the sovereignty of host nations, and in compliance with the provisions of applicable international and/or bilateral treaties /conventions ratified by the United States. d. The unauthorized acquisition, possession, sale, or shipment of recognized resources (see section 1.5 and associated subsections for clarification of resource classifications) by US military and civilian personnel, or personnel accompanying US forces is strictly prohibited. (3) Take such actions as may be reasonable and prudent to safeguard those resources under US control from harm. (1) Provide US forces with the knowledge necessary to incorporate appropriate measures in operations plans to minimize the potential of unauthorized or inadvertent harm occurring to recognized cultural, historic, and/or natural resources. (2) Ensure Commanders have visibility on recognized resources within their area of operations and the ability to make informed decisions on courses of action that minimize the potential for adverse impacts to those resources. (3) Ensure recognized resources coming under the control of US forces are adequately secured and managed. (4) Rapidly transfer control of recognized resources to applicable responsible parties. (5) Ensure compliance with applicable United States, African Host Nation, and International requirements. (7) Intangible cultural heritage resources related to how people live, communicate, and pass their individual and collective experiences between generations. (1) Resources identified for protection under the provisions of 1954 Hague Convention (HAGUE 54). (2) Resources identified for protection under the provisions of 1972 UNESCO World Heritage Convention (including resources on the tentative listing). (3) Resources identified for protection under the provisions of 1970 Cultural Property Convention. 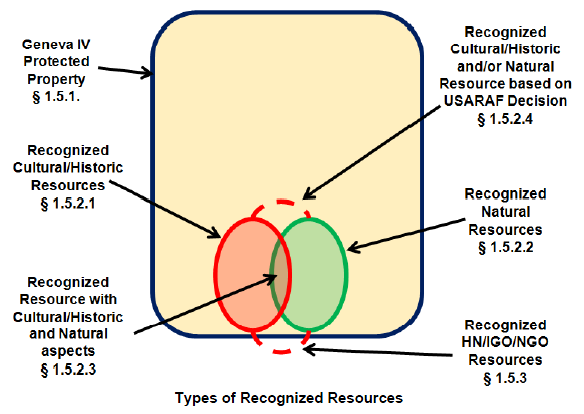 (5) Resources identified on host nations listings that are the equivalent of the US National Historical Register. (6) Inventoried objects/artifacts registered with the International Council of Museums, International Council of African Museums, or similar internationally recognized groups.